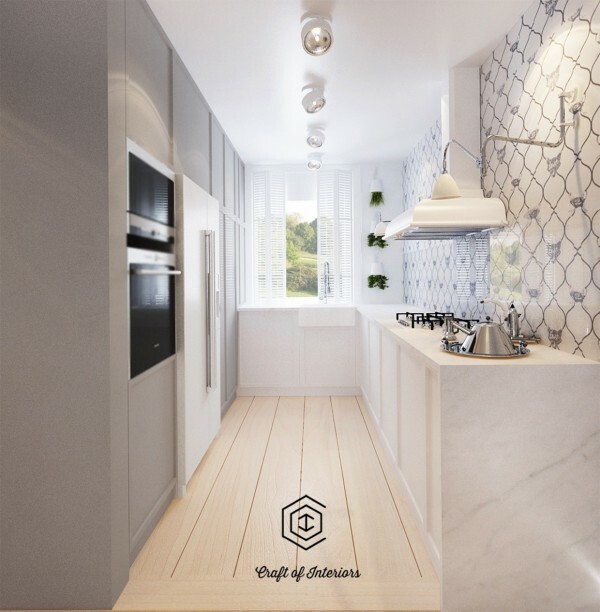 Successful interior design does not draw gender lines, but there are certainly elements that most would consider more soft and feminine. 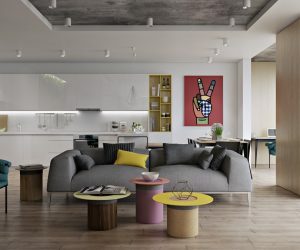 These five homes, from Polish-based designer Monika Rogsuz, manage to use lovely, soft design features without coming across as overly saccharine or frilly. 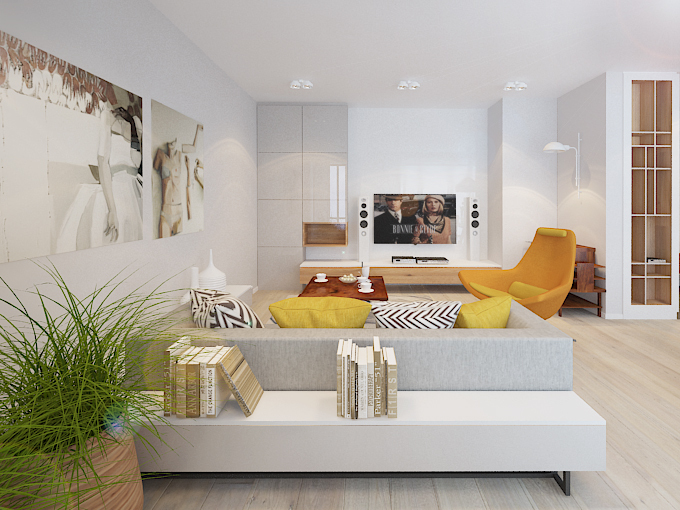 The results are spaces that bring in lovely colors, plenty of sunlight, and simple, welcoming furnishings. 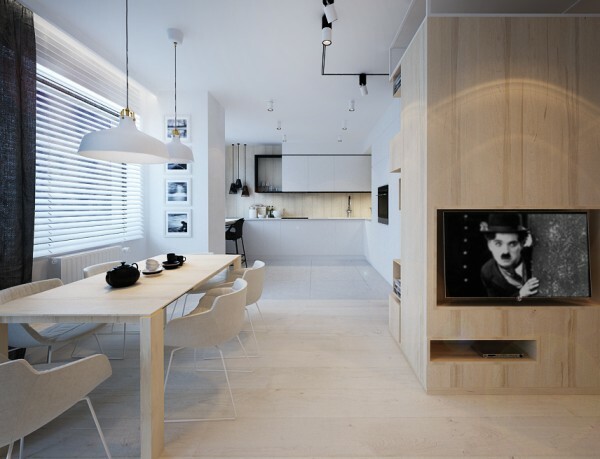 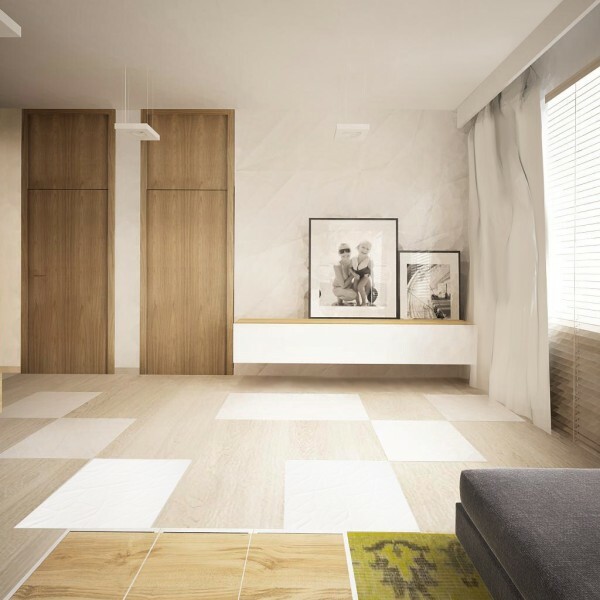 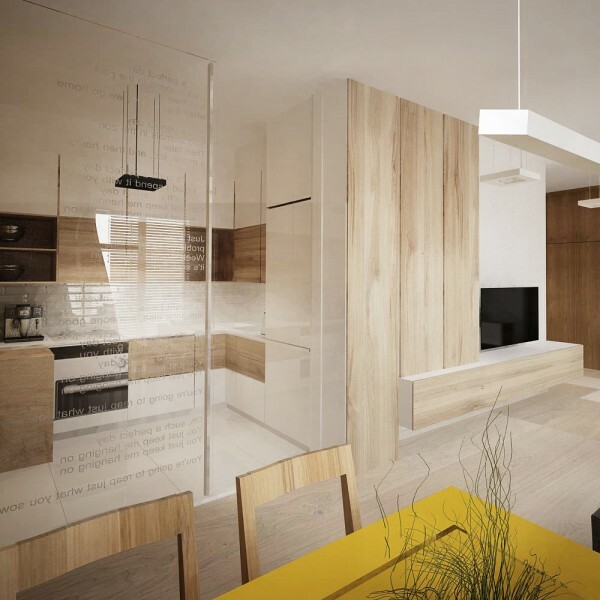 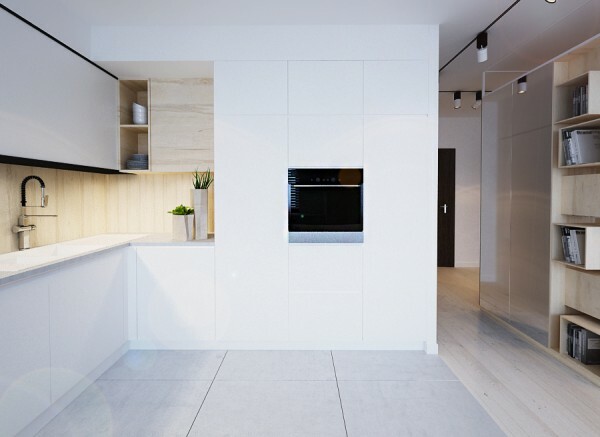 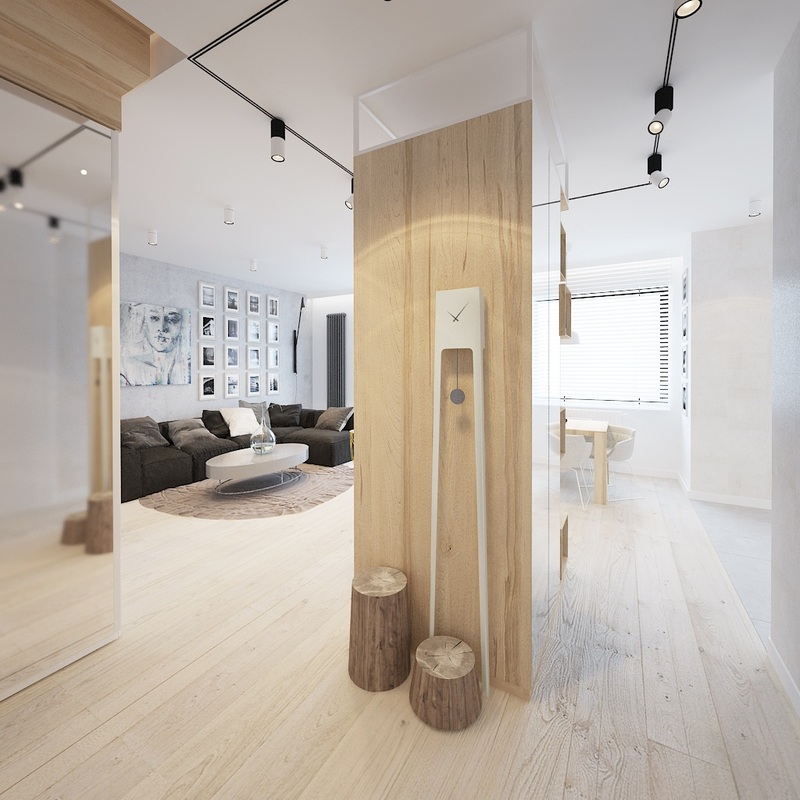 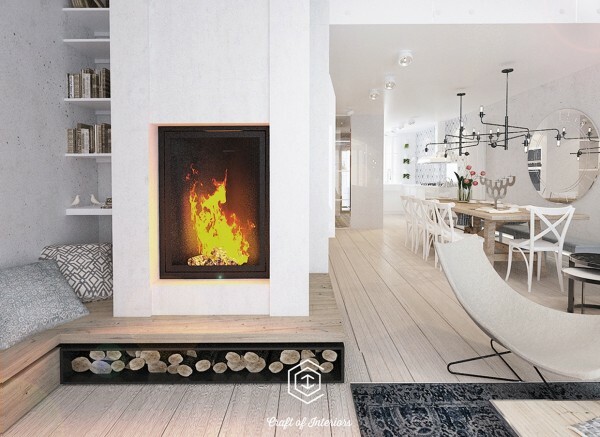 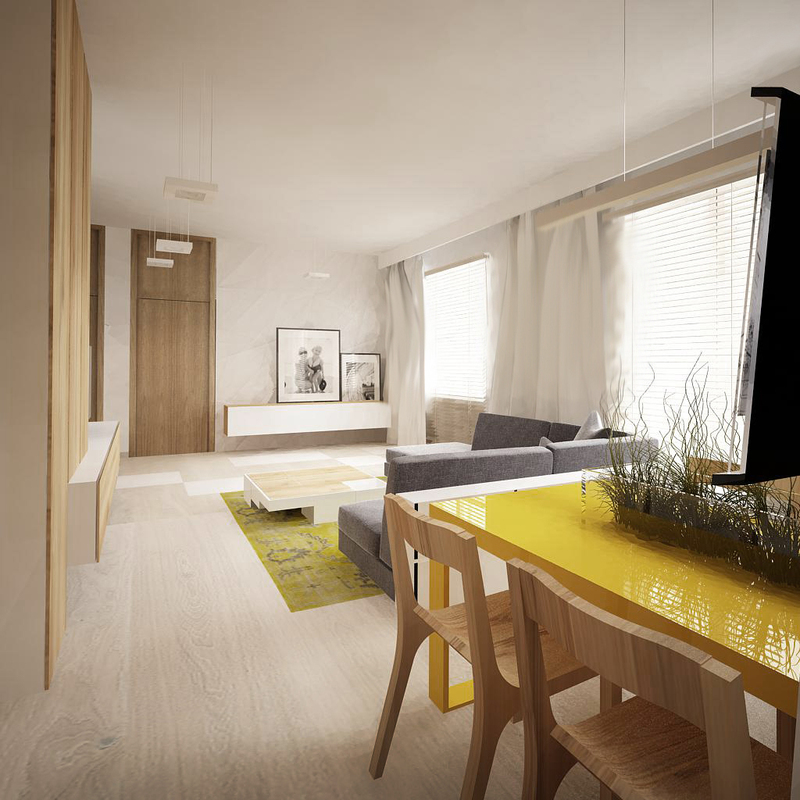 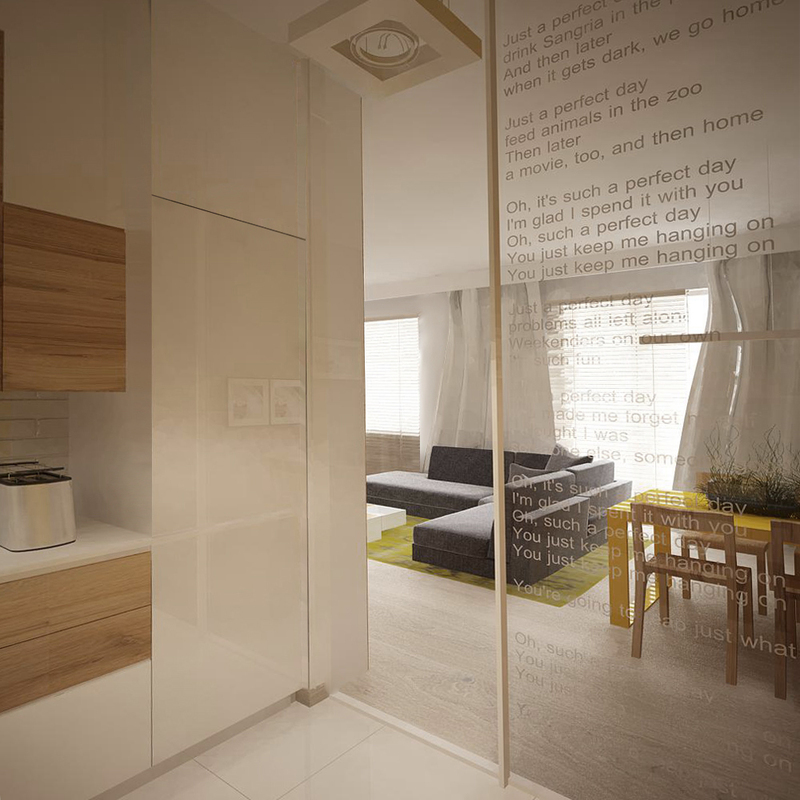 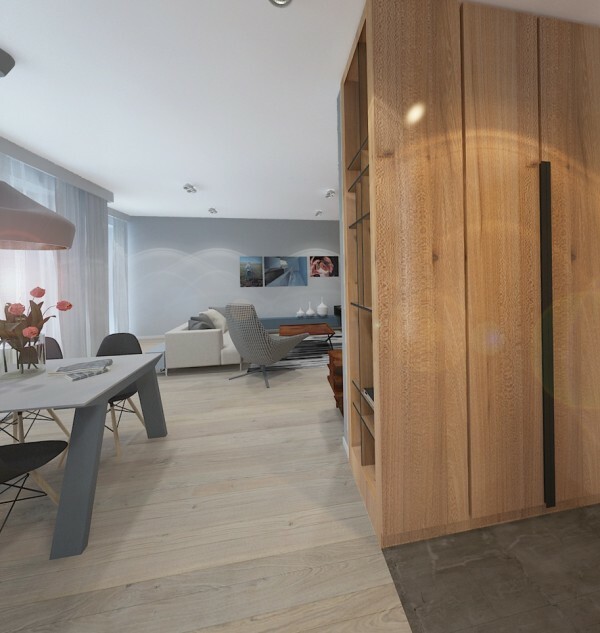 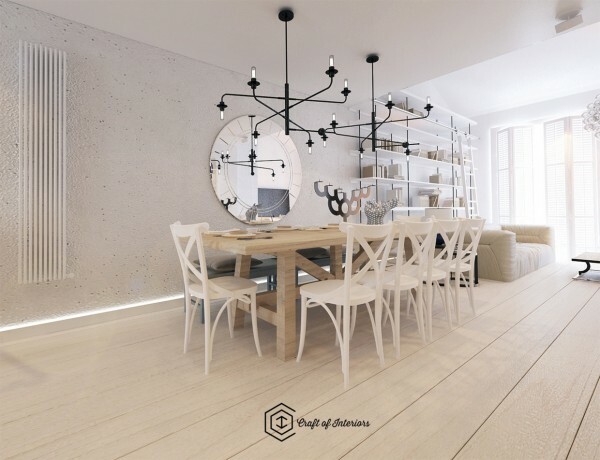 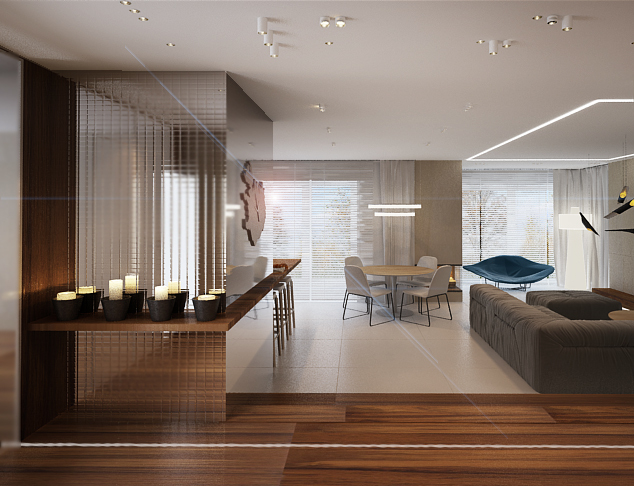 The first apartment, in Wrocław, uses an open floorplan to make the entire space feel airy. 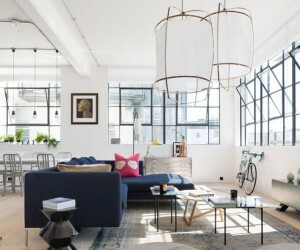 A Prouvé Potence style swing arm wall lamp looms large in the corner. 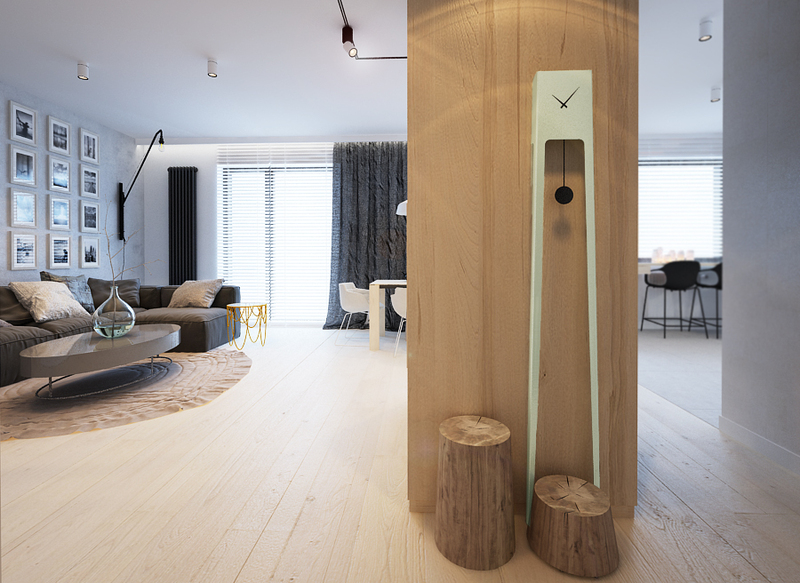 A uniquely modern grandfather clock in a pretty seafoam green is the perfect accessory for the living room. 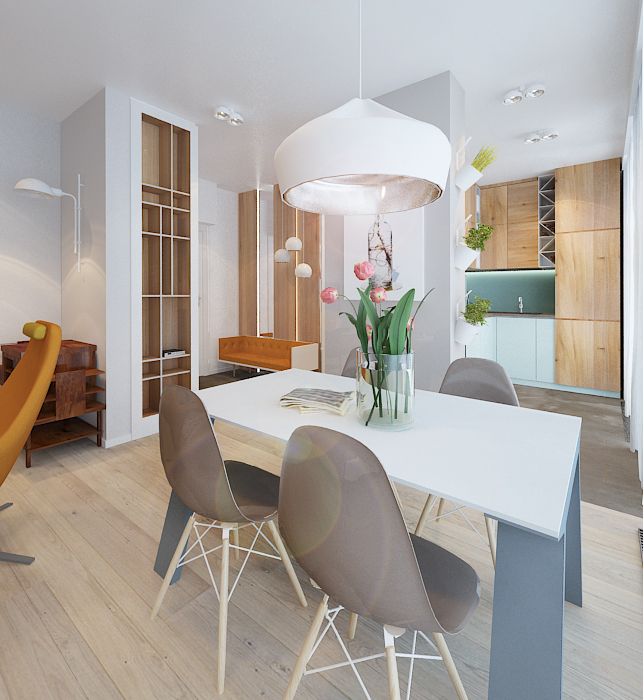 A light wood dining table is nestled against the window for a sunny, pretty start to any day. 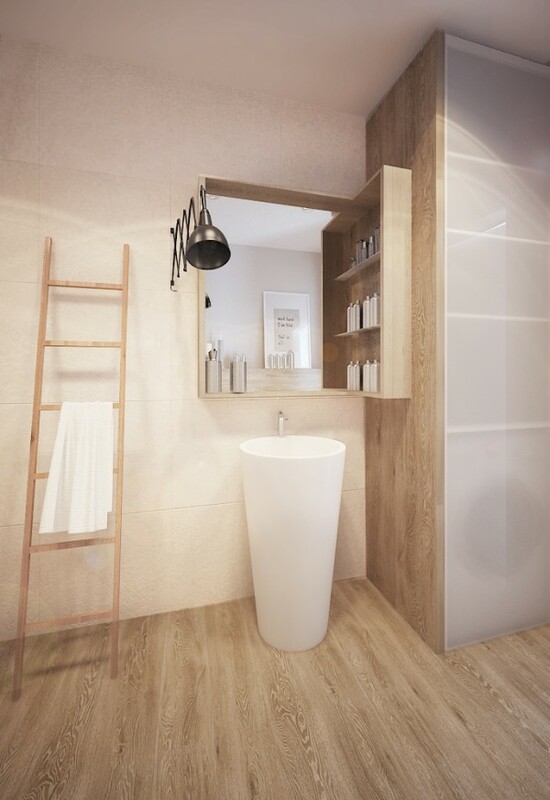 Creative, custom shelving built in light wood provides storage and also hides away clutter. 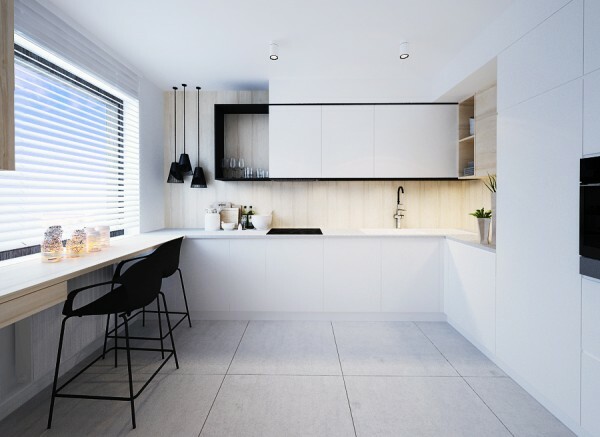 The kitchen is also light and open, with white walls making it feel even more spacious than it is. 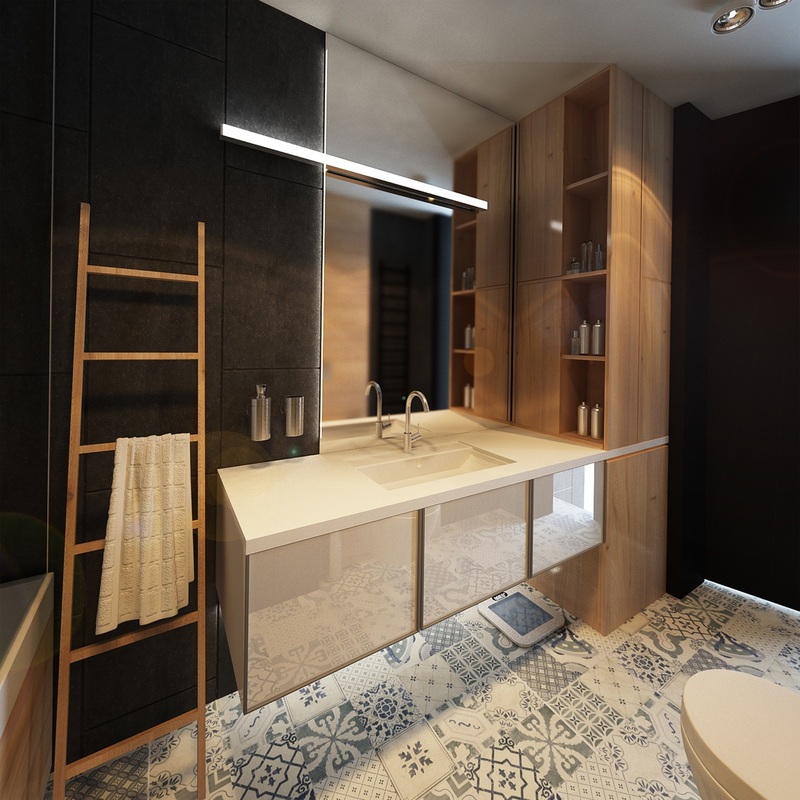 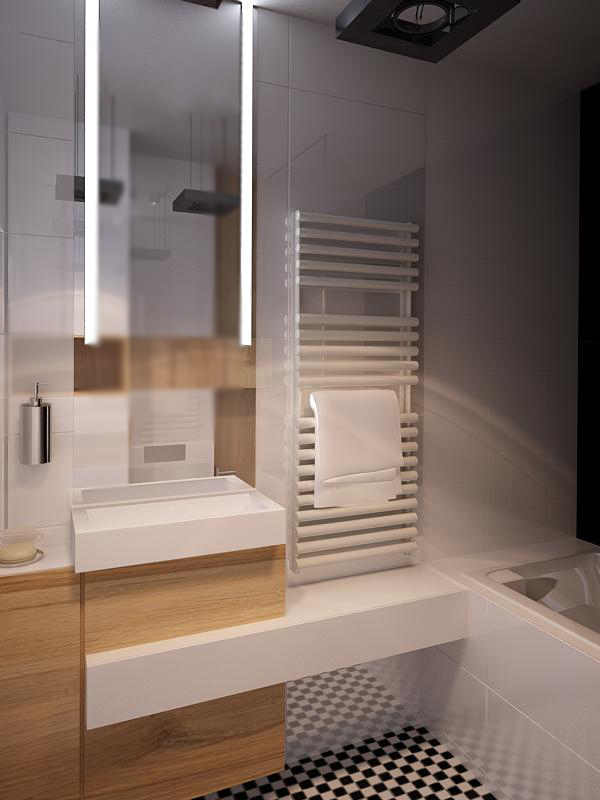 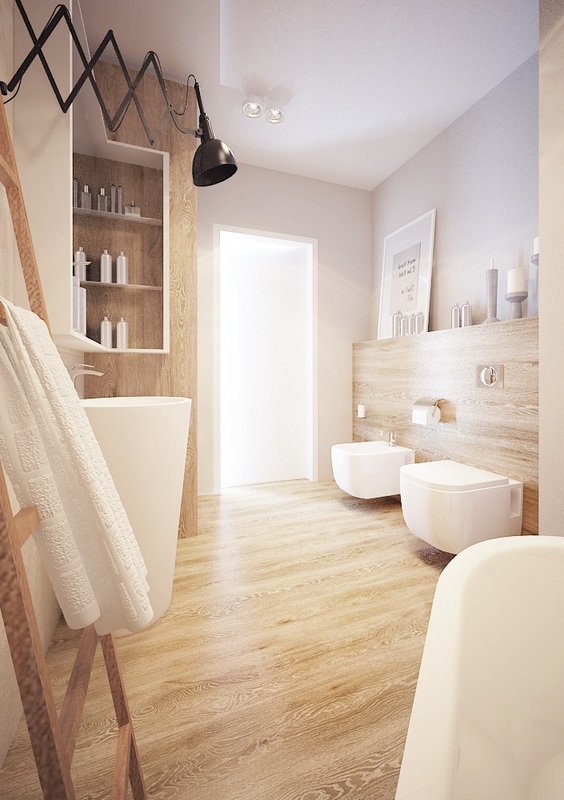 Wood floors and fixtures in the bathroom keep it from feeling sterile, but plenty of clean, white porcelain ensure it’s a comfortable place to bathe. 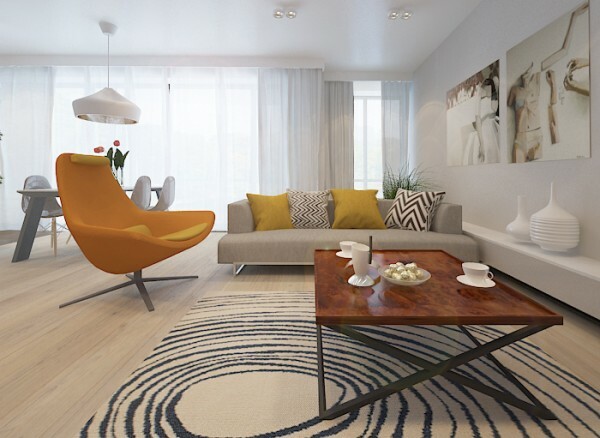 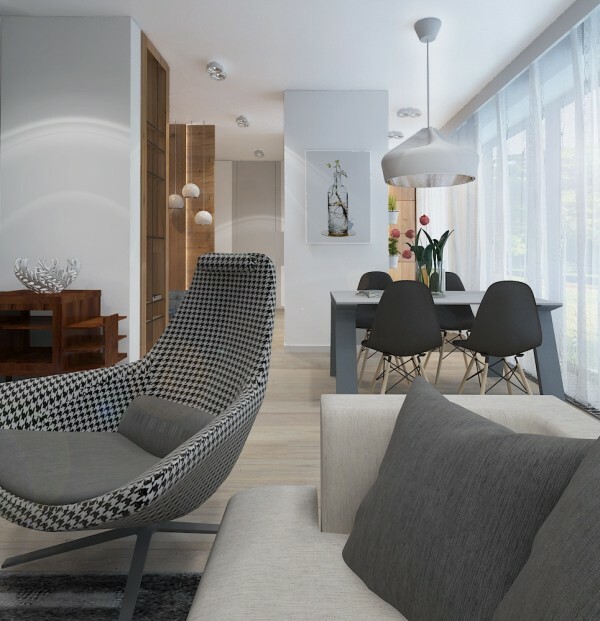 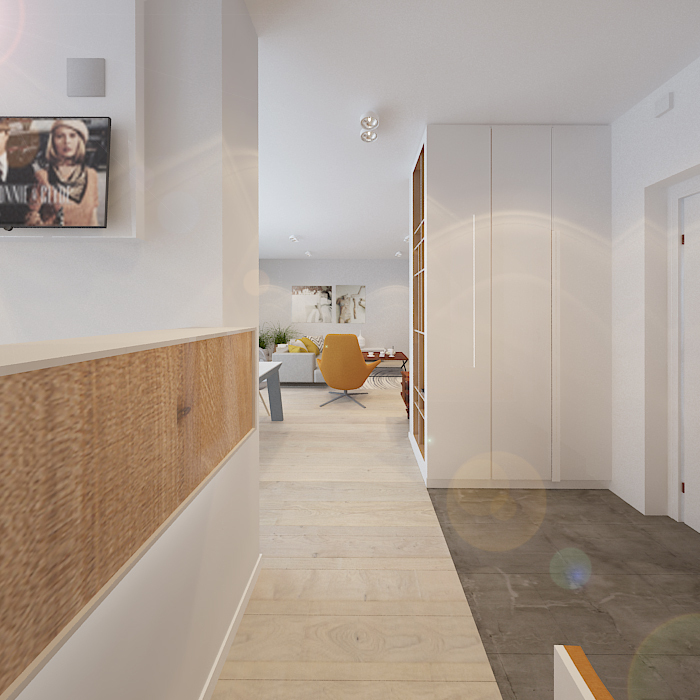 In this next apartment, natural light and wood are still key design elements. 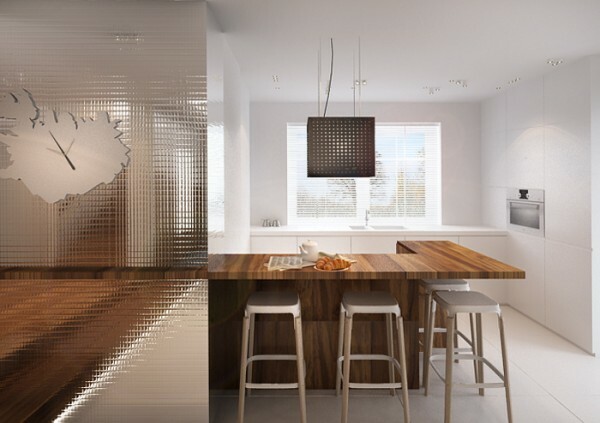 The home also uses creative elements like glass interior walls to keep the space open while also creating division. The glass wall also has song lyrics etched into it, for a truly special effect. The dining room table is another focal point with its reflective yellow surface and central planter. In the bedroom, interesting textures make the space feel more vibrant. 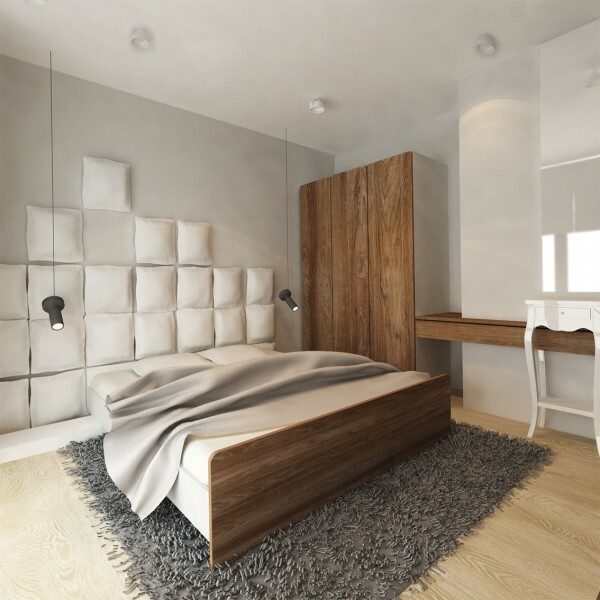 For instance, the deconstructed headboard design is creative but because it matches the color of the wall, it is not too busy. 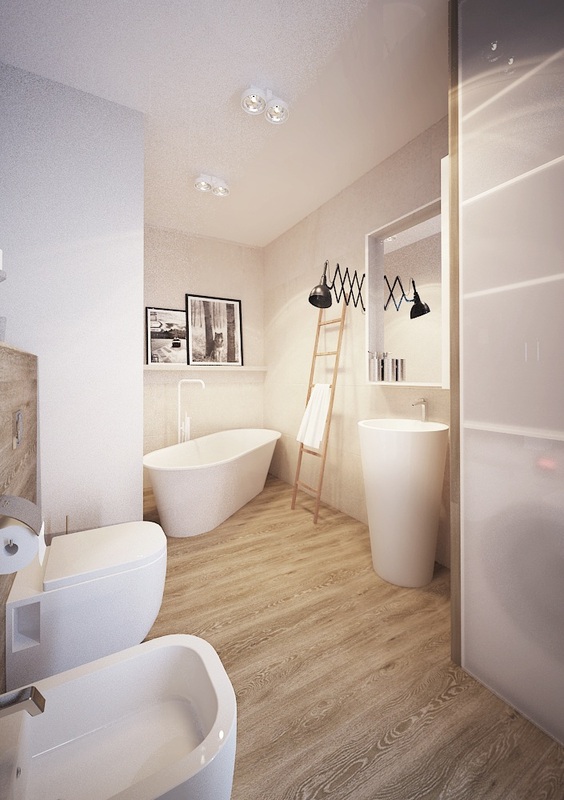 A simple bath rounds out this small apartment with lovely wood accents and clean, smooth white walls. The third house, located in Wrocław, uses a trendy dark mustard color to accent an otherwise white palette. The geometric area rug complements the patterned throw pillows without being overly matchy. 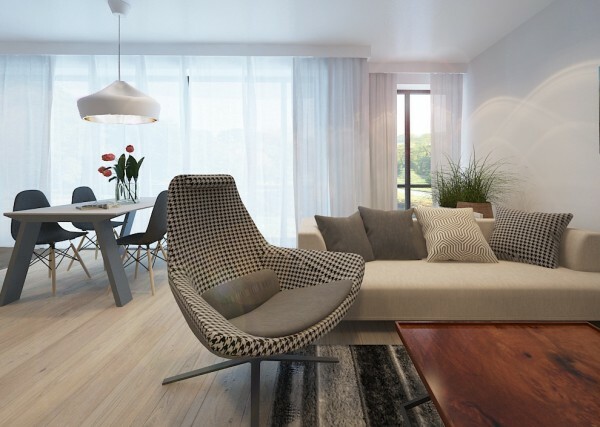 And nothing says modern like a houndstooth arm chair. 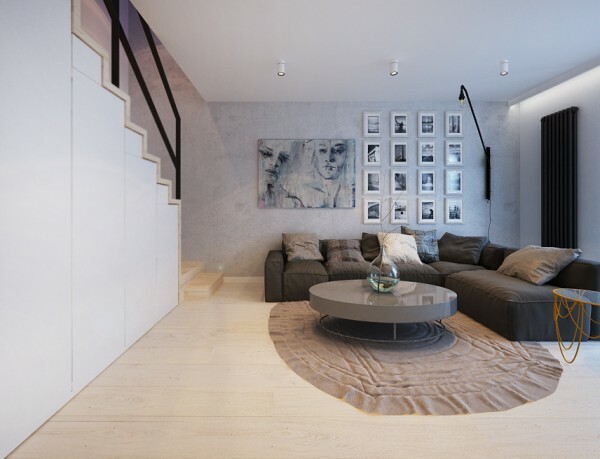 This living room is decorated perfectly for a ladies book club. 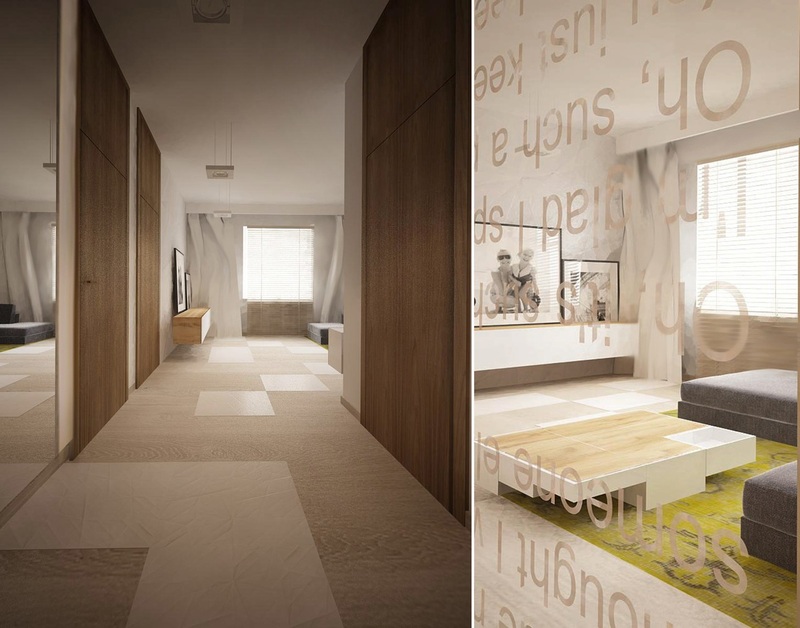 Especially one that decides to read Sherlock Holmes. 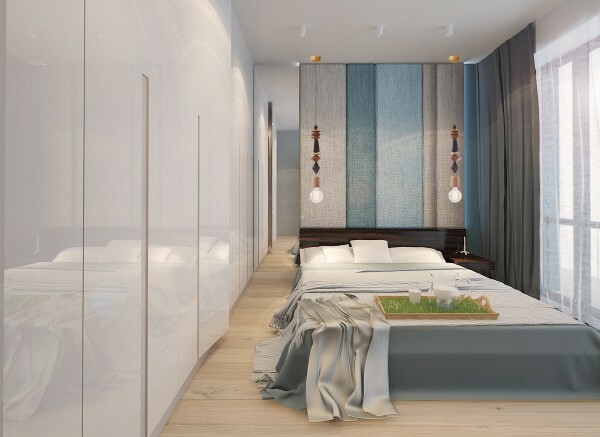 An ombre blue in the bedroom is particularly calming. 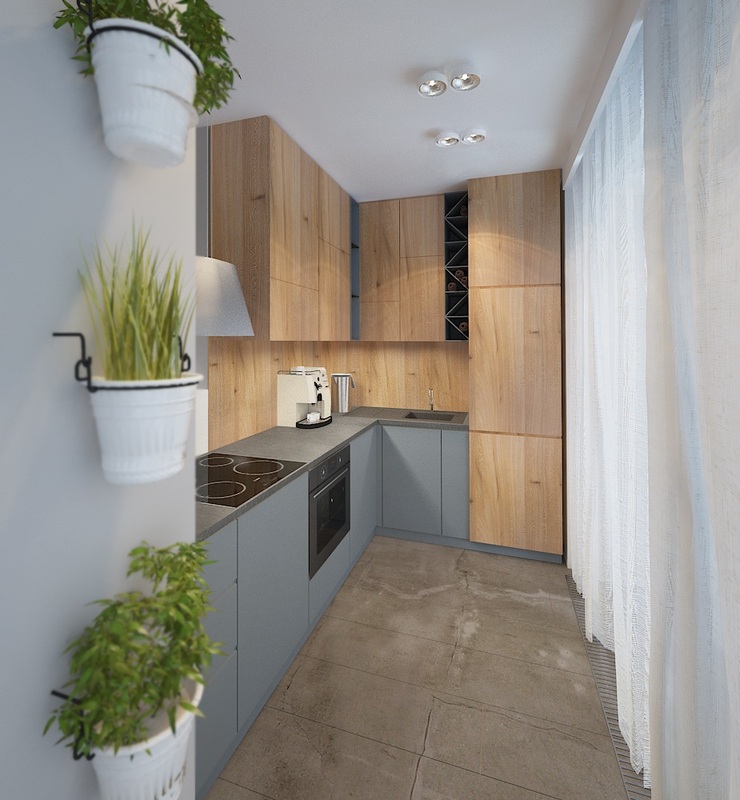 A small kitchen is plenty of room for growing potted herbs, as long as you do it on the wall. 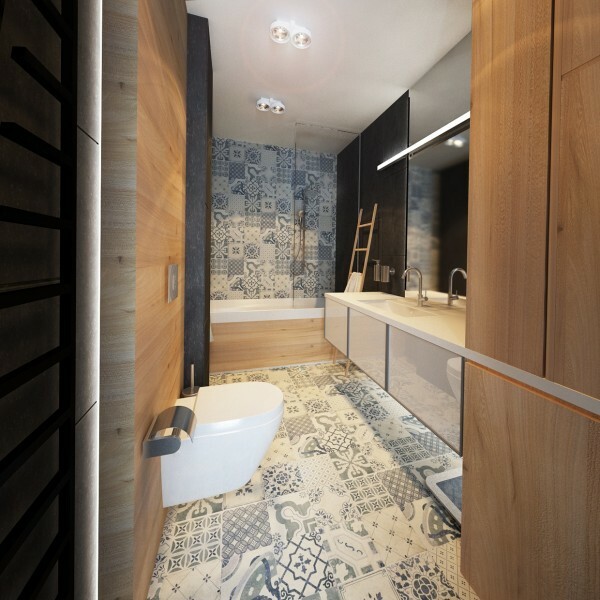 The patterns on the bathroom floor and walls is truly intriguing. 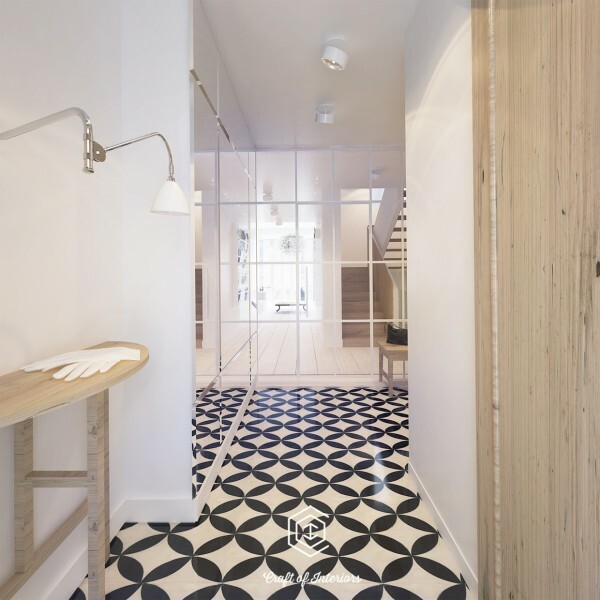 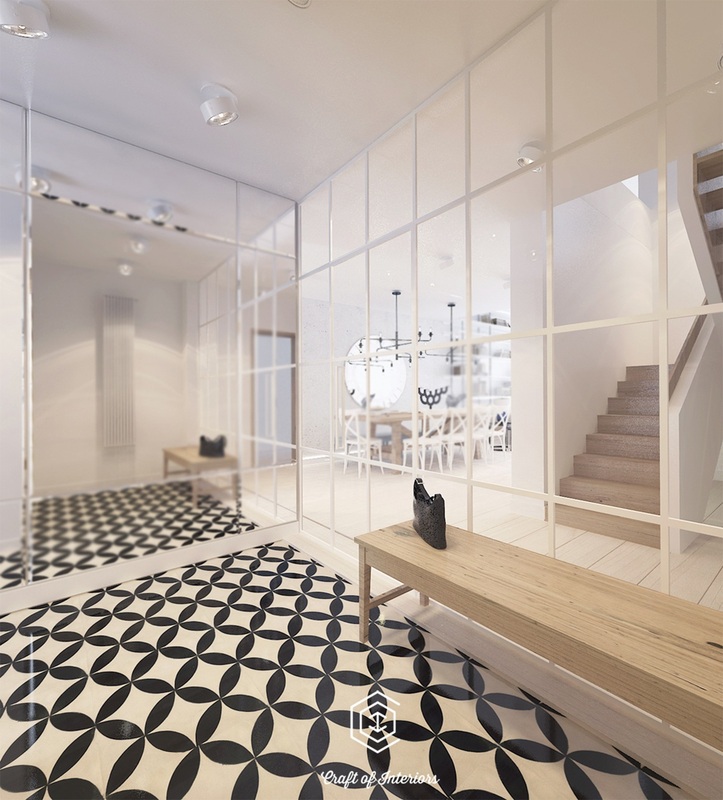 For more patterned floors, we need to look no further than the entryway to the fourth house on the list, which is in Warsaw. 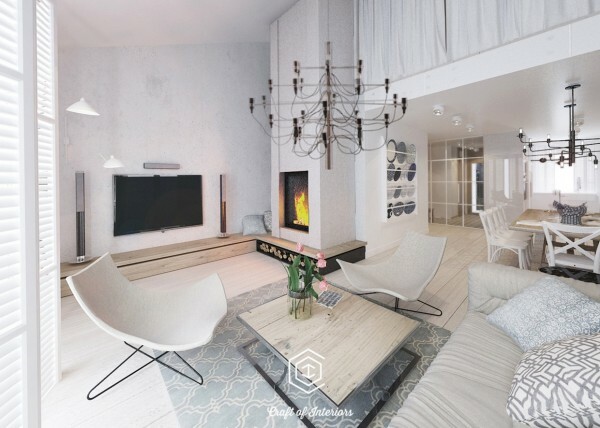 Though the pattern does not make it into the living room, there are still plenty of playful elements, including a neat chandelier and a modern fireplace. 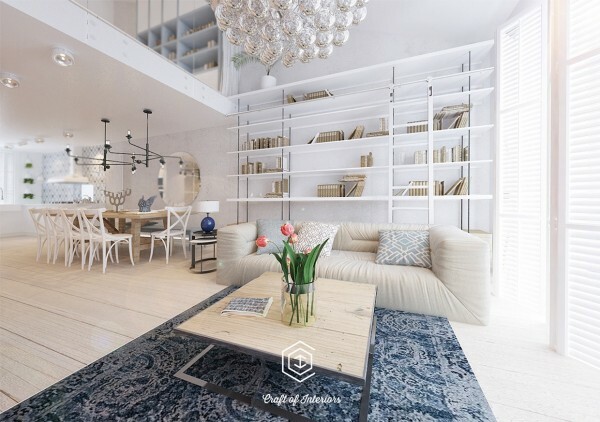 Tall shelving is ideal for a book lover who wants her whole collection on display. 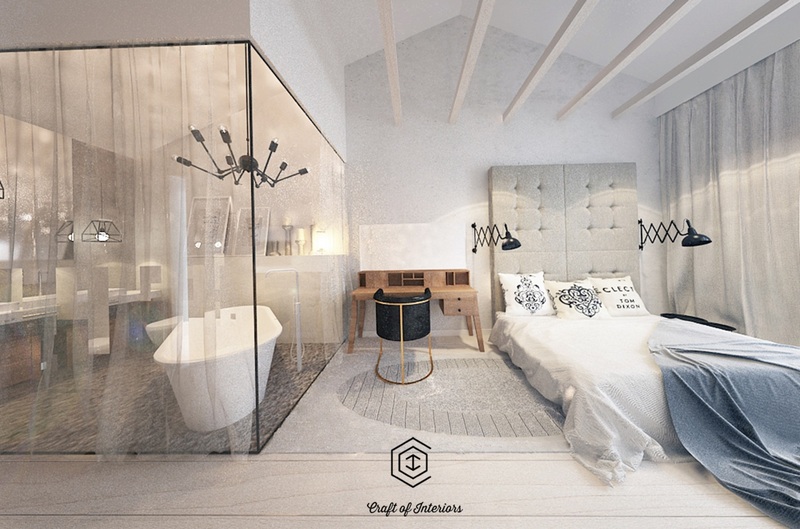 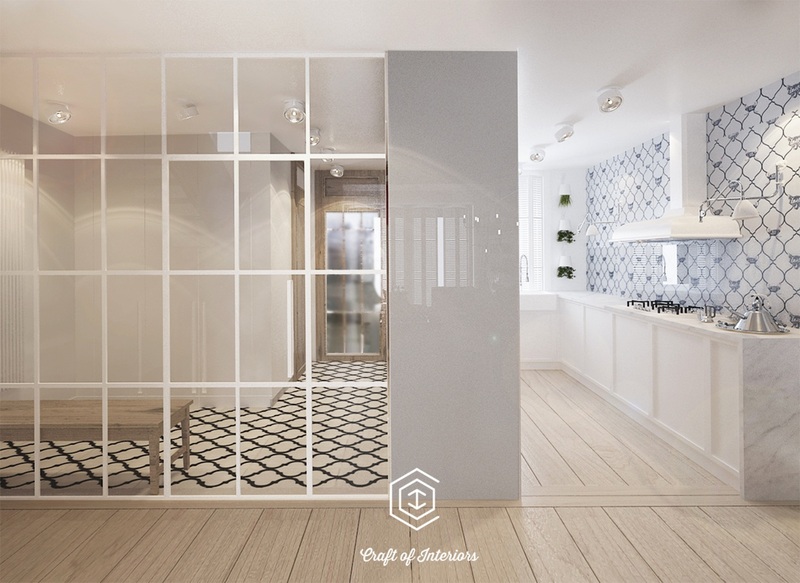 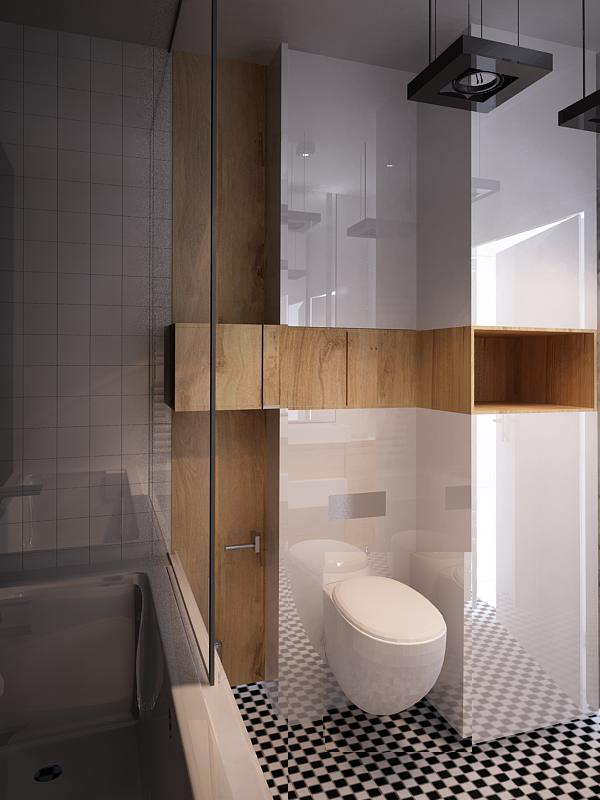 Glass walls in this apartment separate the ensuite bath from the bed that’s fit for a princess. In this final house, in Kraków , we’re treated to a few different views, starting with a cozy gray sofa. 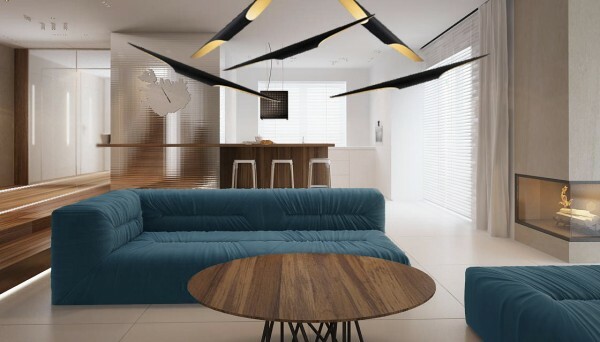 The second view swaps out the sofa for a deep, turquoise which makes the room feel a bit more constricted but does demand attention. 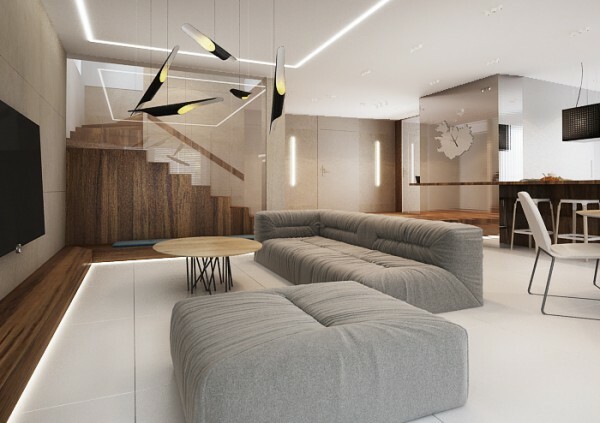 Finally we get to see a sofa fit for Prince himself, upholstered in a deep purple color. 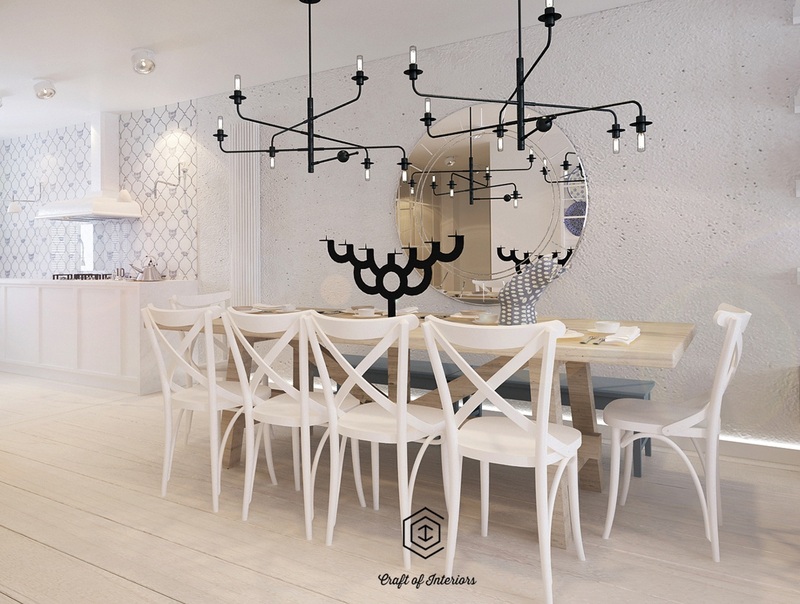 Starburst-inspired light fixtures make sure this purple option isn’t too overwhelming. 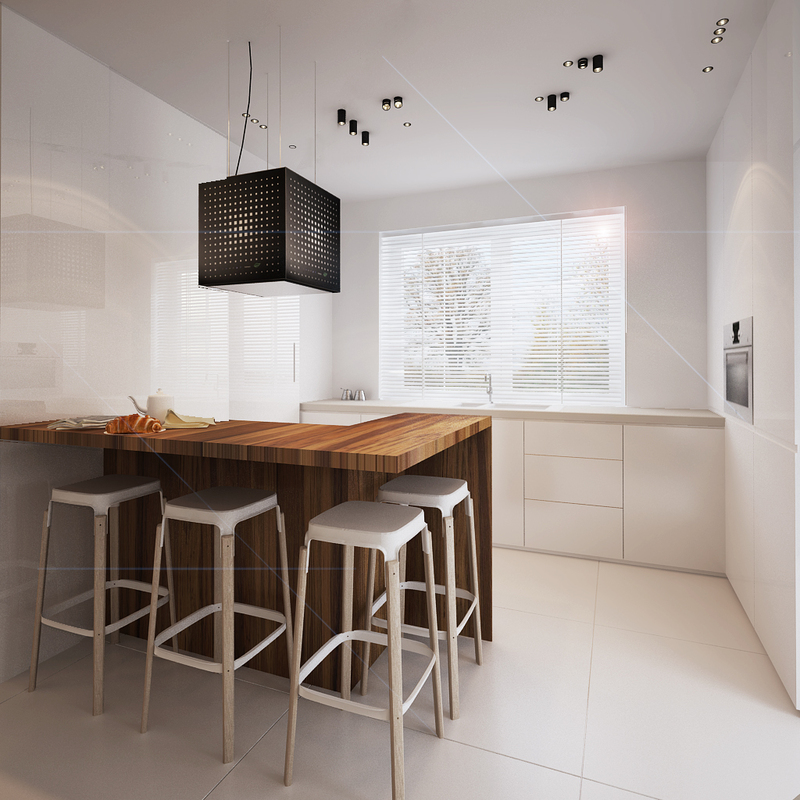 Dark wood floors and kitchen counters are a bit more luxurious than lighter options, but the larger space can handle it. And once again, natural sunlight ties everything together beautifully.